As I write this, California is on pace to have it's wettest winter since 1982. Along with the professional forecasters, not many of us saw the atmospheric rivers coming. 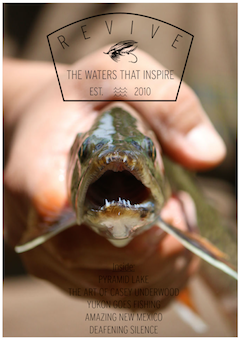 Another surprise event - the Tribe closing Pyramid Lake to all fishing back in early January. What kind of damage would a high desert lake like Pyramid suffer from some rain? After seeing photos of the washed out roads and trashed boat launch at Pelican Point, I realized this winter was cooking up some weather. While I wasn't planning to fish Pyramid until early Spring, I think everyone felt relieved to hear the lake re-opened in February even with limited beach access and State Route 446 still closed. Admittedly, some fear, uncertainly, and doubt hovered over a plan to fish Pyramid in March. First off, getting there. All major highways - Hwy 50 & 80 - were either damaged or going through weekly closures due to the huge snow events hitting the Sierras. Weather aside, imagining what conditions would be like at Pyramid proved elusive since the lake had been closed to fishing for several months. I learned from Rob Anderson's report that the lake had risen about two feet since last winter. So the number one question became which beaches would be ladder accessible and put you into a productive zone. Ultimately, we wanted to go fishing. And that combined with no snow in the 10 day forecast, pushed us out the door. As the lake came into view, I some how expected to see beaches flooded, etc. What I saw was even more strange - not a single ladder at South Nets, and none visible at North Nets! The first thought was - OK, did we not get the memo? The memo about the lake being reclosed to fishing? Yes, that memo. Actually, the Tribe hadn't re-opened South Nets with the February start. But, that didn't explain the complete absence of anglers from North Nets in March. Green can be the color of money at Pyramid. Black can also be money - especially during little or no light of morning as a ladder line goes off during a predawn bite. When the only light hitting the water is your headlamp, and the bite switches on, I have to wonder if color even matters. Let's put that discussion aside for now. I wanted to sing the praises of GREEN. Tui Chubs appear olive green when viewed from above. When viewed from below, they appear white or silver, making them hard to spot against the surface of the water. Olive or green fly patterns with a white or light green side or bottom are good chub imitations. The majority of nypmhs swimming in Pryamid had some shade of green (e.g., dragon fly nymphs, damel nymphs). As the days grow longer in Spring, we're faced with eleven hours of full sun (minus periods of cloud cover). An extended lunch followed by an extended nap is one solution to a strong mid-day sun without much else going on. Another way out of a mid-day fishing slump is to go green. Striping a Tui Chub pattern in light green or charteuse is certainly top of the list, but don't forget the Popcorn Beetle! And during a recent mid-day slump that also included a long, thoughtful period staring out from my chair on the bench, I managed to break out of my funk fishing an Army Green Tadpole.